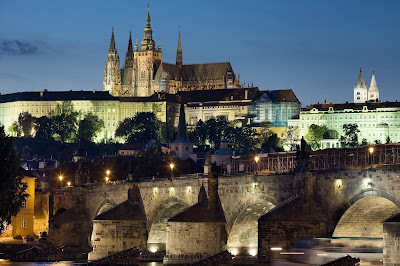 The picture shows some of the beautiful city of Prague. It is home to a great many fine churches but the Czech Republic has a very low level of religious affiliation - after the devastation of Communism 86 percent of its 10.5 million inhabitants claim to no longer have a religious affiliation. The Czech Republic is, of course, home to the Grand Master of the Order, HE Jan Count Dobrzenský z Dobrzenicz and many of our own GB members were there in St Vitus Cathedral when Cardinal Duka became Chaplain General to the Order. The good news is that it seems that there are plans afoot to make Good Friday a national holiday. The Communists are against it - 50 years ago they abolished it as a day off. A bill was initiated by Socialist Prime Minister Bohuslav Sobotka's Cabinet on June 24. The proposal originally came from the co-governing Christian Democratic People's Party. According to Deputy Prime Minister Pavel Chief Bělobrádek, the impact of an additional public holiday on the economy is minimal. Czech media expected that the project will find a broad majority in Parliament. Already 90 of the 190 MPs have signed a corresponding cross-party application. Considering that 86 percent of the 10.5 million inhabitants of the Czech Republic are non-denominational, and only ten per cent Catholics this seems remarkable but at least reintegrating Christian tradition into the secular calendar.